You are a Contractor who would like to respond to a bid invitation with a bid on a project. You are an Owner collecting bids from potential contractors and you would like to create standard form to be included with the Invitation to Bid to be completed if a bid is submitted. Bid Proposal Form, Construction Bid Form, Contractor Bid Proposal Form. 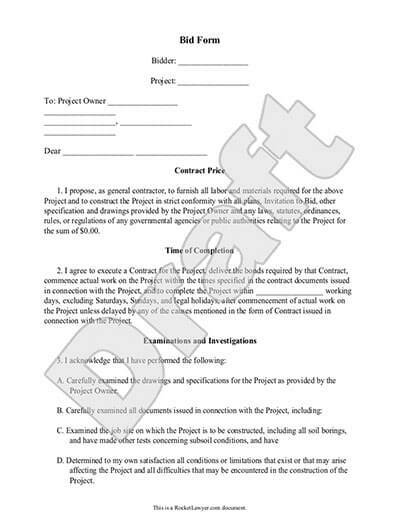 Project owners and contractors can use Bid Forms to outline all the terms and conditions of a bid on a construction project. 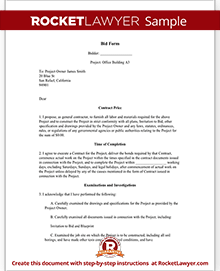 Project owners can create blank Bid Forms for all applicants to fill out, or contractors can create their own when placing a bid. Essentially, the form states that the contractor has reviewed the project documents, and contains all the bid details. In your construction Bid Form, you'll want to include information like: the name of the project; where the bid will be returned; a list of all the documents provided to the contractor in connection with the project; a list of all the documents attached to the Bid Form; any estimates made in the Bid (for example, you may include a performance bond, a bid bond, or any other documents the owner requires); and the date the document was created. If there is an Invitation to Bid, the Bid Form should be completed according to the specifications in the invitation. Give a reasonable time estimate: Everyone wants work done quickly and efficiently, but there's such as thing as "too fast." Resist the urge to give unreasonable estimates in your Bid Form. It shows the receiving party that, although you might not have the fastest estimate, you're on the level and being reasonable. That goes a long way. Acknowledge the project specifics: If you're an electrician bidding on a contract to wire an apartment building, chances are you know far more about those particulars than the person soliciting these bids. Be specific about your knowledge. Note all the details and how you came to your estimates of price and time. Particulars of your business: Note whether your business specializes in the process you're bidding for, whether you're more of a generalist, etc. You may want to consult an attorney with any questions. The construction Bid Form will be signed by the Contractor who is submitting the Bid. You do not need witnesses to the signing nor do you need to have the signatures notarized. You may want to use our e-sign services which enable both parties to sign the agreement electronically without the need for each party to sign a printed out agreement. Our step-by-step interview process makes creating a printable Bid Form easy.